3.) Removed both Stoneforge Mystic and Stonehewer Giant and replaced by Steelshaper's Gift as the only equipment tutor. 6.) Added Goldnight Castigator . Doubling potential damage taken is a risk but with Purity on the battlefield this can gain an insane amount of life to fuel Aetherflux Reservoir . 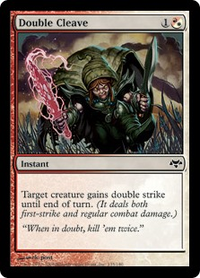 As an insurance also added Pariah's Shield to redirect that damage to either Stuffy Doll or Boros Reckoner . Much testing is required. 7.) Streamlined the mana base as well; minimizing land that etb tapped. Lapse of Certainty is probably my favorite "gotcha" card for the Sunforger package, though obviously it doesn't have particular synergy with your commander. Magnetic theft and temur are definitely going in, thanks Narabedla! I think I’d prefer Lapse of Certainty over blast, but I’ll keep it in mind for sure. I like the journal here, because with so many cantrips drawing us cards, it’s going to be important to be able to have a lot of cards in hand to amass a strong enough toolbox to protect while keeping up the aggression. (Maybe just Spellbook would be better for the curve though). I’ve been having a lot of success with electrodominance in general recently; give it a try, you might be surprised. In EDH, when a player with a blue source and at least mana in other sources open on a field. It is a threat. It is a threat not because of a 7 mana spell, but a 2 mana spell, not a spell that deals damage, counters spell, destroys permanents, tutors, or cheats costs, but a bounce spell. Cyclonic Rift , C-Rift, the big wave, whatever you call it, people know it as one of the strongest, most backbreaking spells in all of EDH, if not the best card in the format. I am here to say that is isn't. Part of my series on why other popular staples aren't good ( Phyrexian Arena , Rampant Growth ), or are simply not good in a specific way ( Rhystic Study ), I am not here to deny the power that a card like Cyclonic Rift has, but simply that it isn't a good enough card to warrant the hate or love that it receives. Before I go over why it isn't good, I need to go over why at nearly every power level, it is good. In casual EDH, the 50% or less, the Precons, the jank, lies it's the weakest state. That is where all removal spells, sweepers, or countermagic is the weakest, especially bounce. If no one has threatening boards, why remove them. You'd rather spend 7 mana on a spell to improve yours most of the time, yet those games go long, the Cyclonic Rift acts as a Fog to save you, Sleep to get in for damage, or real removal if you use it on a player's end step if they have to discard just after. Almost all cards that show heavy play at higher levels show some play at lower ones, and while the price-tag may limit it for most casual players, it does work. 75% decks often use permanent-based engines to support their gameplan. Think Beast Whisperer along with a deck full of cheap elves, or Paradox Engine in a deck will a lot of Temple Bell effects and mana rocks. 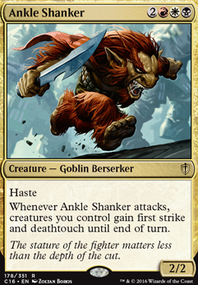 These decks and their creators often expect opponents to remove threats, so have many threats to remove. They try to protect against sweepers, the only punishing cards for going so wide, with anti-sweepers, think Heroic Intervention , or Boros Charm , and protect against some single-target removal with effects like Darksteel Plate . Because of this, and because indestructible and hexproof don't protect against a mass bounce effect, along with Cyclonic Rift being the only mass bounce at instant speed that doesn't affect you at all, and doesn't target, it is truly the best anti-75% sweeper by many standards. In the competitive setting, while not bad, it is mostly relegated to being a 2 mana Chain of Vapor or a Into the Roil that doesn't draw a card, that can let a combo deck get through stax locks once in a blue moon. That is some powerful stuff. So why isn't it the best EDH card, an efficient spell in nearly any metagame? 2 options for removal, one that crushes many lists and the other a sleek and useful trick? Because it isn't hyper-efficient, nor is it unbeatable, nor is it irreplaceable. To start, many cEDH decks that run it run consistent amounts of countermagic to protect it's possible great effect, and numerous cards could fit the spot. It isn't alone. Blink of an Eye , the second Into the Roil has been used over it in many combo lists that more mana-efficient options and many forget the slot all-together, in favor of a cantrip or other removal spell like Abrade or whatever. It isn't very dominant there, and so is easy to explain why it wouldn't be amazing there. In casual lists, Cyclonic Rift costs about as much as half of many of the casual decks, or even more than some entire casual decks that I have seen. Bringing money-cards wins there, as would a Consecrated Sphinx that costs less money, and I'd wager would have more powerful an effect. Again, an easy argument, but I believe it works. The really hard place to argue against Cyclonic Rift on the surface is the middle tiers. The 75% lists. Legitimately, I think it is because in the 75% players don't consistently a highly interactive 'metagame'. They just prefer to be interactive 'ingame'. 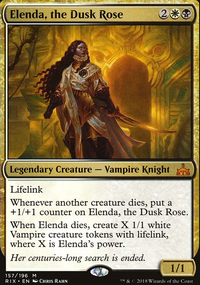 This comes down to theory, however, when a deck, for example, an elf list abusing the Llanowar Elves style effects along with untap effects to keep making mana, dumping it into something like Ezuri, Renegade Leader . All of that deck and many others get shut down by Null Rod . While that card may be less powerful than other cards against any random deck, as many players know exactly what decks they face, they can play to those decks. This means general removal, like Anguished Unmaking may be worse if artifacts and walkers don't see much play, you'd rather Mortify . Or if instant speed doesn't help you much, as a lot of City of Solitude / Dosan the Falling Leaf effects exist in your meta, Vindicate , etc. This is pretty basic knowledge, however, the point here is that there are many, many replacements for Cyclonic Rift in different metagames, and I want to share the ones, only in mono-blue, that in the 75% are why Cyclonic Rift is overrated. This isn't to say it isn't the best, but that if many, many replacements cost way less $$$ and are occasionally better, that one card shouldn't be considered the best in every situation. Aether Gale , sorcery, only hits six things, has to hit your things if you don't have enough targets of only your opponents, targets, etc. Yes, there are reasons this is clearly worse. Why is it better? Politically, you don't have to hit cards from players you team with. Similarly, if you like the Howling Mine on someone's field, don't bounce it. Someone Banishing Light ed someone else's threat you can't deal with? Don't bounce it. Also, 18 cents. Compared to ~20 dollars and I think it is a steal for budget lists. Also, it is 2 mana cheaper, despite not being an occasional Disperse . Evacuation , the downside is simple, it doesn't hit non-creatures, and bounces your own things. The upsides are for decks that want their own things bounced. ETB effects like Mulldrifter (You can respond to the sacrifice on evoke if you want! ), Archaeomancer (infinite sweepers by returning Evacuation , or just recur another card), Duplicant , Solemn Simulacrum , etc. It is 5 mana too, still an instant, and is only 2-3 dollars right now. 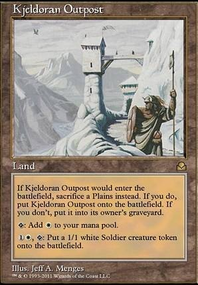 Other options for this could be AEtherize , Whelming Wave , Inundate , Engulf the Shore , Profaner of the Dead , or Scourge of Fleets if you just want mass creature bounce, each with ups and downs, some that only hit opposing creatures, some that are instants, some with graveyard synergies, etc. For mass nonland bounce that doesn't target? There are tons of options, plenty with lower mana costs than Cyclonic Rift . Take Coastal Breach . It does a mass bounce for just 4 mana (with 3 opponents), leaving you enough to rebuild first, and being able to be cast much faster, making up slightly for the sorcery speed. Or Crush of Tentacles , 6 mana? 5 mana and an 8/8, it needs to be in a deck with enough cheap drops to hit surge to be worth it, but an option. Devastation Tide is a personal favorite, if you run Aminatou, Brainstorm , a lot of scry, Mystical Tutor , Long-Term Plans , Jace, the Mind Sculptor , or are lucky, it is a 2 mana bounce everything. Really strong, however, sorcery (unless you cast it with Miracle on an opponents turn. Like a big creature attached? Kederekt Leviathan . It even comboes with flicker effects, or can be repeated for 2 mana with an effect like Animate Dead or 3 mana at instant speed whenever with Necromancy in black/blue. Only need to target one player for political reasons? River's Rebuke . Point is, there are options. Even outside of blue, sweepers that can get around the normal protection is seriously strong. 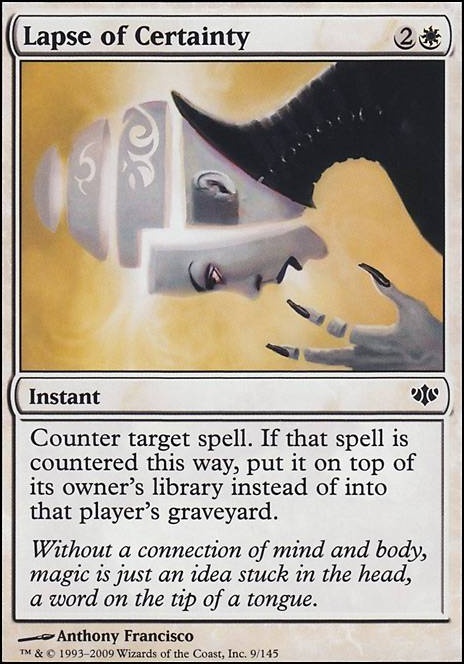 Terminus , Hallowed Burial , along with most mass exile effects in white from Play of the Game to Final Judgement / Descend upon the Sinful to the new Urza's Ruinous Blast , etc. Mercilous Eviction in W/B, the -x/-x effects in black like Toxic Deluge or Black Sun's Zenith , etc. in any color, Perilous Vault exists. These are half of why I think Cyclonic Rift is overrated. Not because it isn't great at what it does, but that it isn't that much better than the rest. The other half is simple. Every color (sorry colorless) has answers to Cyclonic Rift off the top of my head. White? Teferi's Protection , Lapse of Certainty it. Blue? Swan Song it. Dispel it. Black? Many lists abuse cards like Inquisition of Kozilek or other discard to remove powerful cards from opposing decks. Red? Pyroblast or Red Elemental Blast are cEDH staples and are very efficient. AxNoodle on Budget Aurochs Tribal! joaoguaxinim I have tried not to, and instead put in Selesnya Signet . Most aurochs don't cost that much mana, and so I don't need that much ramp. Llanowar Elves is also $1, which is unnecessary. Thank you for the suggestion, though! What do you think of Lapse of Certainty ? 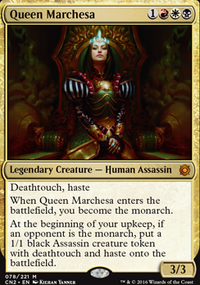 For your wife's avacyn deck, I would consider running Faith's Reward , Rebuff the Wicked , as well as Lapse of Certainty . Also Sun Titan would be nice for recursion synergies with Aura of Silence, Grasp of Fate, O-Ring and such. I am also a fan of Sublime Archangel , but that's going into angel tribal lol. 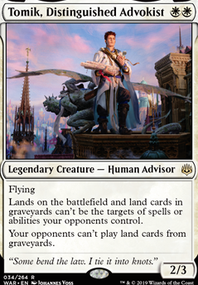 Hmm Austere Command would be helpful as well, as the modular choices gives you options to work with. Tragic Arrogance is another one where it can reset the board as it makes people sacrifice instead of destroy, which gets around some clauses. Sword of the Animist is good for the consistent ramp. Since your not running any planeswalkers, The Immortal Sun is a great source for cost reduction, buff, as well as card draw. For tech hate you can run Blind Obedience or Ashes of the Abhorrent if you want to run them, even Grafdigger's Cage as well if you play against those types of decks as well. Authority of the Consuls if you going against more of the going wide strategies. Hope that helps for your wife's deck!